It's World Cup time again. Which image of the nation do you want to share? These days, I've been given the choice between the worst of Korea's drinking tradition with PSY's Hangover, and the best of Korea's festive culture with a cheerful 'Daehan Minguk'. 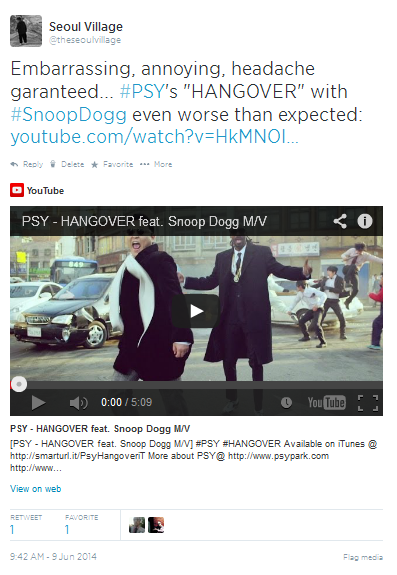 After 'Gangnam Style' and 'Gentleman', and before 'Daddy' this Summer, PSY released 'Hangover', an abject object compared to which his previous hit almost looks like a work of art (and my take at "Gentlemanslaughter" was already not very kind). Still not sobering up in its 3rd day, the Park Jae-sang - Snoop Dogg duo reaches 41,339,792 views, 409,066 likes, and 143,408 dislikes on YouTube. This 26.0% "dislike ratio" comes after Gentleman's 16.3% (674,716,081 views so far), and Gangnam Style's 11.1% (2,012,404,672 horse burgers served, and counting). I don't recommend watching this pathetic video that not only lists all the possible disgraces and 'DON'Ts' in etiquette, but also drills nastily through your eardrums for 5 interminable minutes. 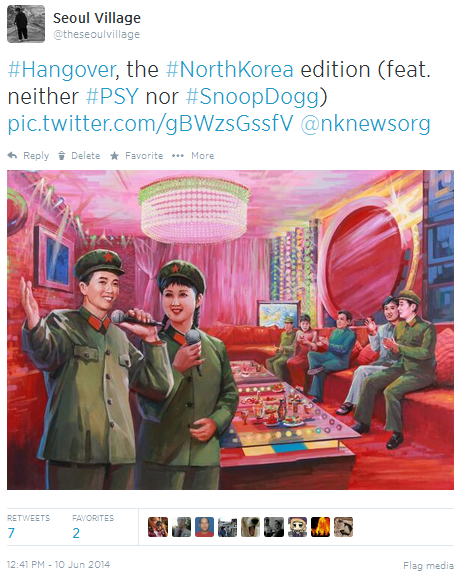 I guess @DanaDeMercurio nailed it by writing "I need those 5 minutes of my life back" in a tweet listed, along with mine and a few others, in an article aptly titled "Psy’s Hangover Gives Some Nausea" (Jeyup S. Kwaak - Korea Realtime / Wall Street Journal 20140609). At the end of the video, there's an interview of Park Je Chun*, who composed this welcoming 'daehan minguk' with festive Korean rhythms, ideal to alternate with the more 'taeguk warrior' / Western rhythm version made popular in 2002. Anyway, go Korea! And please, support responsibly. 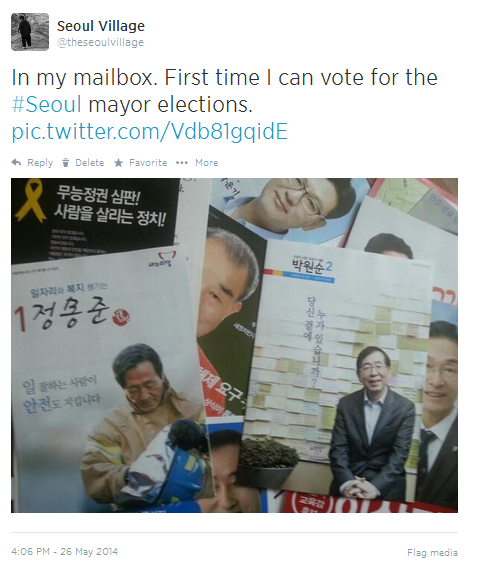 Korea posted its highest turnout in almost two decades for local elections. 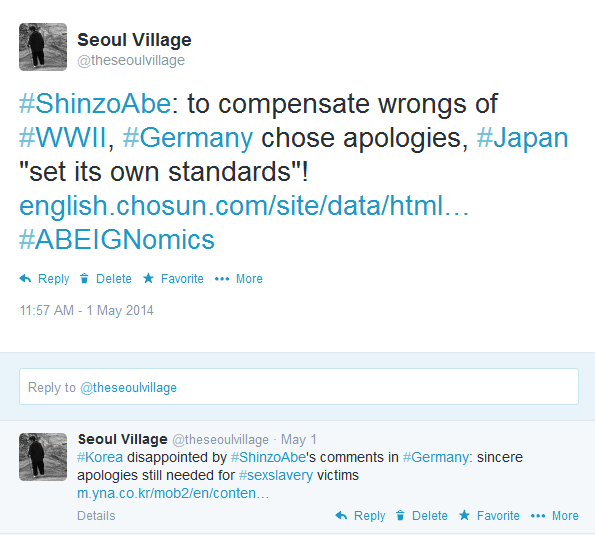 If the ruling Saenuri party managed to overcome the "Sewol effect"* in key battles (e.g. 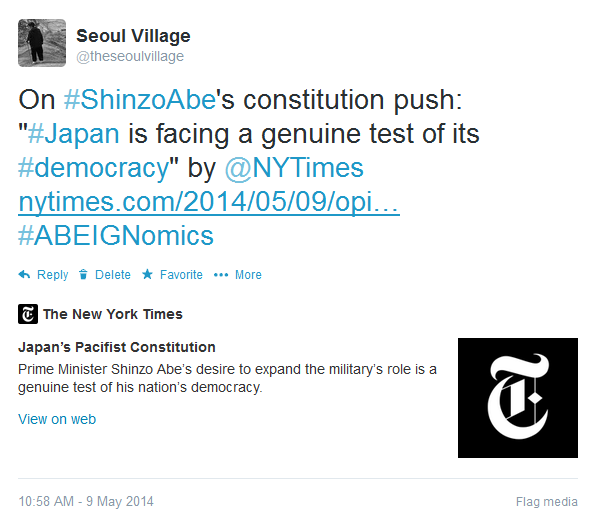 Incheon, Gyeonggi), the duel for Seoul proved even easier than expected for the incumbent. 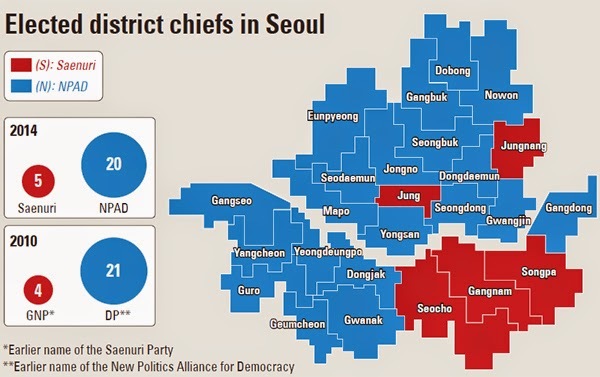 In Seoul, conservatives lost 5 districts in 4 years. 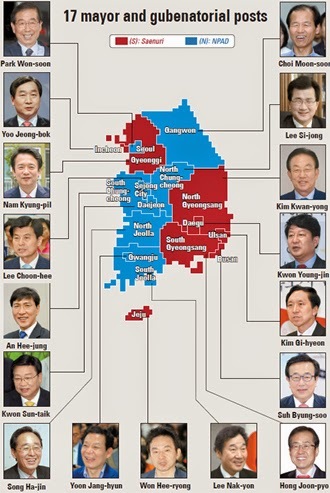 From blue districts to a Blue House? 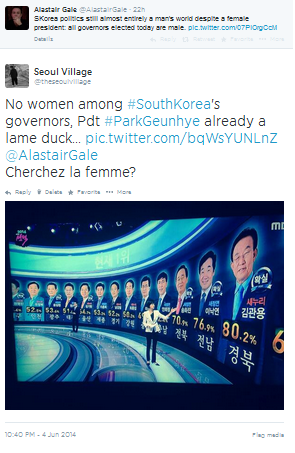 So among "South Korea's Super PAC" (Park-Ahn-Chung), Park Won-soon emerges as the winner of the day in the race for 2017 and the presidency: while he defeated Chung Mong-joon in a direct clash, Ahn Cheol-soo remained stuck in a NPAD alliance unable to mark clear progresses (the ex-independent already saw his approval rates plummet after he joined forces with the opposition). On both sides, the perfect timing for new faces to emerge. If any. 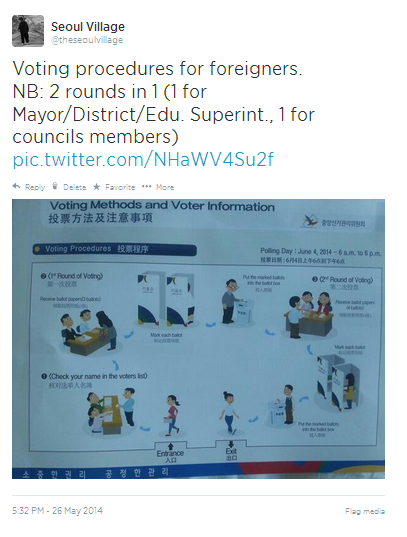 On a personal note, I was allowed to vote for the first time for the mayoral election as a Foreign resident (in 2011, I could for the referendum, not for the main show). 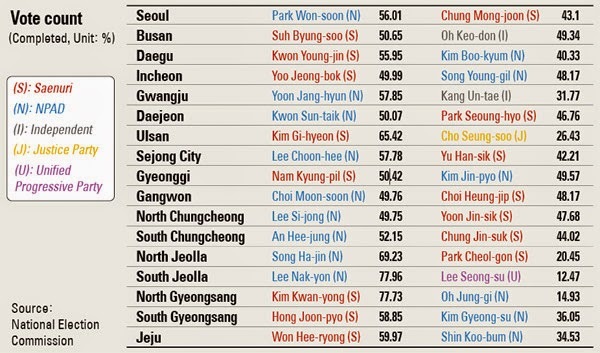 * It seems that the ones who most benefited from the Sewol tragedy were the left-wing candidates for education chief (big win for Cho Hi-yeon in Seoul). To start with, a BBQ is not the healthiest thing on Earth. But a welding torch...? P.S. (so much for Lieutenant Colonel Bill Kilgore): no, it didn't smell of napalm, and yes, it tasted great. Not as much as the lamb stew, though - no flamethrowers involved there.